My First Microscope - Compound or Stereo? 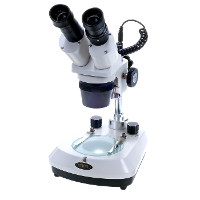 “Should I buy a compound or a stereo microscope for my child's first microscope?” is perhaps the most frequently asked question to the staff at Microscope.com. As you might expect, the answer depends on the level of your child's cognitive ability, but there are some good guidelines that we typically recommend. Age is a useful surrogate for cognitive development, which is important to consider when buying a microscope. For example, you can imagine how many calls we receive from parents and grandparents with "very smart" kids. However, even the smartest six year old's brain is not that well developed to deal with the abstract nature of the images viewed under a compound (high power) microscope. As a result, for younger kids, we lean towards buying a stereo (low power) microscope or increasingly, we recommend a handheld digital microscope. In summary, the reason is that we believe that the microscope needs to engage the child quickly. They need to be more than educational....they need to be fun, cool and engaging. They need, in other words, to compete effectively with video games and the like! A microscope such as our Explorer handheld digital microscopes achieves this instant engagement with a vengeance - and in our opinion, are, therefore more likely to lead the child into more serious work at a later age. Make it fun! That said, here are more comments on the compound and stereo choices. For children less than 9 years old, a stereo microscope offers more immediate engagement and is easier to use. A stereo microscope is used to view those specimens that children love: bugs, rocks, crystals, flowers etc. Macro specimens that are found around the house and garden. Items that they relate to and which, on a stereo microscope they can see in three dimensions. A stereo microscope takes a few seconds to set up before the cries of "Wow, that's so cool" attracts other members of the family so that poor housefly or bee's stinger can quickly turn into a cross-generational viewing opportunity! Stereo microscopes employ low powers of magnification - 50x and below - which are easier to focus than higher levels (40x-1,000x) of magnification. A young child can easily use a stereo microscope themselves particularly as the set up and preparation is minimal. One caveat though. A stereo microscope is by definition, binocular. Often, younger children do not have eyes yet wide enough apart (interpupillary distance), to use both eyepieces. An alternative is to opt for a monocular dissecting microscope or, as my kids did, to use one eyepiece until they are old enough to use both. After all, they grow like weeds! Instant gratification, immediate engagement and ease of use. All strong benefits of a stereo microscope helping to develop a child's interest in science. Compound Microscopes: Compound microscopes use high powers of magnification (40x-1,000x), and are used to view micro specimens not visible to the naked eye: cells. 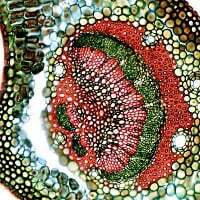 Their greater complexity can be an advantage or disadvantage depending on your viewpoint since the set up and preparation require considerably longer time than a stereo microscope. They afford a terrific parent/child bonding time or it is a chore! Unless you already own some Prepared Slides, much of the pleasure of compound microscopes lies in making your own slides. Your child can 'own' the manufacturing process - picking an onion from the refrigerator, helping you slice it with a Microtome, making a slide mount and finally, viewing it under the microscope. The preparation time is infinitely longer than the actual viewing, which depending on your viewpoint is either a good thing or a bad thing! The results, while often stunning, are not as immediately gratifying for younger children since a compound microscope produces a two-dimensional image of a somewhat abstract concept, in this case cellular structures. 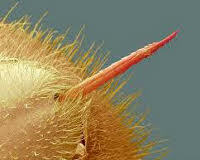 It is no surprise, therefore that a fly's eye is more engaging than a blood cell to a young child! Middle School is often referred to as a time of transition for children and so it is for microscopes. Compound microscopes become more relevant for Middle Schoolers as their brains and curriculum engage in more scientific discovery. As mentioned above, a good digital solution includes the Explorer handheld digital microscopes or simply add a digital microscope camera to your compound or stereo microscope choice. 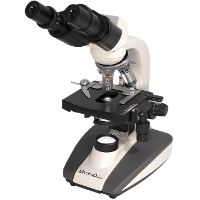 The Explorers offer a remarkable combination of quality, ease-of-use and affordability and are guaranteed to inspire cries of delight with the ability to view both macro and micro specimens up to 200x magnification. Both enable the kids to view and image all sorts of cool, phantasmagoric images to equal the most evil aliens imagined. Yet it also opens their eyes to a completely different and very real perspective on the world. For parents, it is something other than a video game or TV to share with them while also lending the satisfying knowledge that, apart from being fun, it is also educational! Under a microscope, the kids can view whatever they like. They learn and perhaps most important, they retain some wonderful visual images that help fire their imagination in other ways. You will doubtless witness some innovative new alien life form drawings to prove it!